In my job as a producer for a local TV talk show, I go through pairs of scissors like crazy. The blades quickly become dulled by constantly being used to cut paper scripts and tape them onto 4” x 6” cards for the host to have handy. Or, scissors will grow legs and wander off, ending up on coworkers’ desks in other departments or vanishing into a Bermuda Triangle of office supplies, never to return. Scissors are the most requested office supplies and at one time, the bane of my boss’ business existence. She took to ordering extra pairs of scissors and stashing them for emergencies. That never lasted long. Someone’s scissors would disappear, usually as we’re preparing to tape that morning’s show. In a fit of desperation, someone would grab the first pair of scissors they could find, usually, a pair sitting on someone else’s desk. That person would intend to return the scissors, but they’d somehow vanish before that. One morning, I found myself desperately searching for a pair of scissors, because mine had grown too dull to cut through a sheet of paper. My coworkers were busy cutting their script cards, so I raced into the copy room to see whether some unsuspecting sod had left a pair lying around. 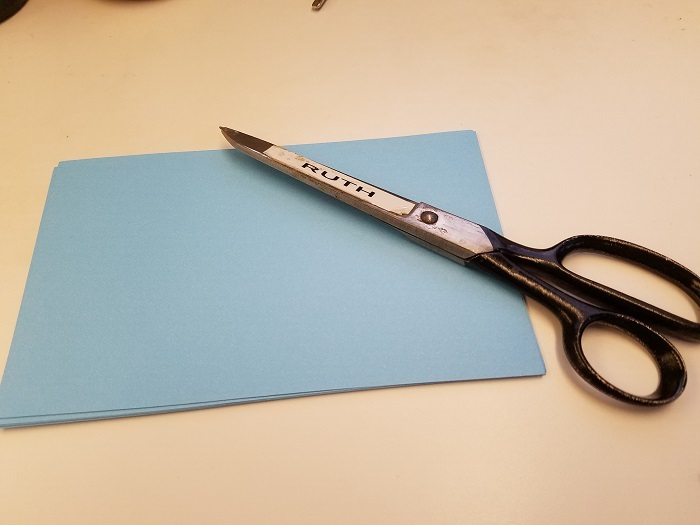 I opened drawers at random, rooting through pens, pencils, and paper clips, before coming upon a pair of large, clunky steel scissors nestled among rubber bands. They were the heavy-duty scissors from decades past, with black painted handles. I slipped my fingers into the handles and gave them a test snip. They seemed to work, so I carried them back to my desk. They sliced through paper with ease, and I happily made my cards. Ruth never raised her voice. She didn’t need to. There were plenty others with the lung capacity to bellow out details. Ruth was quietly efficient. She also had a firm grasp on her office supplies. She labeled everything that belonged to her: tape dispensers, notebooks, message pads, pens. And scissors. Everything that went walkabout ended up back in her work area; a magnificent feat, since she shared space with at least two others who worked different shifts. Random folk also regularly wandered up to the assignment area looking for information, plopping down at an empty chair, using whatever tools were at hand to jot down incoming details. I can’t remember exactly when Ruth retired, but it has to have been at least ten years. Since then, her office supplies must have gravitated from one desk to another. Two years ago, our station moved to a new building with updated technology and ergonomic furniture. Somehow, Ruth’s scissors made the cross-town journey among a stash of office supplies which ended up unpacked and tucked into drawers and cabinets. They remained in the copy room until the morning I found them a year and a half ago. Since then, they’ve lived in my pen holder, towering above my pens and pencils. The steel blades have cut through countless sheets of paper without showing any signs of becoming dull. They’ve also never gone walkabout. I don’t know whether coworkers are turned off by their large, clunky size, or believe they’re too dull to do the job. I don’t mind that no one wants to use them. I find scissors quietly efficient, like the woman who originally owned them, and I’m happy to keep them as long as I can. And every morning, as I lift them out of the pen holder and prepare to cut my scripts, I think about Ruth and wonder what she’s doing and whether she’s enjoying retired life. I also wonder whether her stuff at home contains white tape labeled with her name.